My pet “phon-prob” concerns velar nasals: what makes them so special (and rare)? Why is it they are far more constrained than n and m, at least in most languages I know of? E.g., why doesn’t English have words like *ngail, *ngight, *ngine, *ngoon, etc. There must be a simple answer to this obvious question, but I can't understand why the combination of "velarity" and "nasality" is somehow exceptional, whereas velar stops are unproblematic. I don’t know whether anyone has an answer that would satisfy Robert. I haven’t got one myself. The usual explanations in terms of markedness theory seem to me to be post hoc and circular (because X is rare, we say it’s marked; then it is the markedness of X that’s responsible for its rarity). There are of course plenty of languages in the world that do have initial velar nasals. One must remember that the languages familiar to Europeans are by no means representative of the world's languages. Even in Europe, an initial velar nasal is quite common in Welsh, though only through mutation of an initial velar plosive: e.g. fy nghi ‘my dog’ və ŋhiː, from ci ‘dog’ kiː; and fy ngardd ‘my garden’ və ŋarð, from gardd ‘garden’ ɡarð. In colloquial spoken Welsh the fy və bit can be dropped, leaving the velar nasal phrase-initial. See the map and discussion in the World Atlas of Language Structures. Part of the map is reproduced in miniature here: You can see that initial velar nasals are found particularly in central Africa and in the southeast Asia – Pacific area. Of those languages in the database that have a velar nasal as an independent phoneme (234), there are more that allow it in initial position (146) than that disallow it (88), which you may find surprising. Of those languages in the database that have a velar nasal as an independent phoneme (234), there are more that allow it in initial position (146) than that disallow it (88), which you may find surprising. 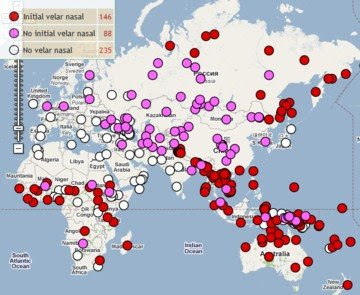 On top of that, in Turkic languages (which would account for a number of the pink dots in the middle of that map), initial nasals of any sort are rare. So even 146 yeas to 88 nays probably overstates the rarity of initial velar nasals. I'm intrigued by the white dot that seems to be over Wales and Ireland, since both Welsh and Irish have a velar nasal phoneme, which can occur in initial position, although in both languages only (as you said) as the result of a mutation. I find it interesting (from a purely personal perspective) how an initially daunting word of this pattern (Vietnamese "Nguyen", a very common personal name) became so easy to pronounce after just a little exposure. Re: markedness, I wouldn't say we have to phrase it in the circular way you did above. At least to my mind, when we find a rare feature, we called it "marked", but indeed we can say that it's rare because it's marked. But what marked really means to me is that there are perceptual or articulatory features about that phoneme or structure which make it less common. We simply use "marked" as a catch-all term to include all sorts of features about the item under discussion that make it less common cross-linguistically. One could add Hebrew and Aramaic as per the "Spanish & Portuguese" tradition, ie Sephardic Jews of Northern Germany, the Netherlands and (later) England, some Italki traditions and through loans, in Judæo-Spanish and -Italian vernacular languages. There, [ŋ] represents Ayin, originally a voiced pharyngeal fricative. Sorry, should read: in their Judæo-Spanish and -Italian vernacular languages. I'm not sure whether the common Cantonese (?) surname Ng counts as word-intial or word-final, or both. A nurse with this name on the ward where my wife was being treated was referred to as "Nurse N. G." by the rest of the staff. I don't really know about Cantonese, but didn't the name have a "final"? Given that ŋ has a zero allophone, that might be the short name there is. Aargh. "Shortest" name there is.